Mayor Mitch Landrieu and Criminal Justice Commissioner James Carter were joined by community and faith-based leaders at Israelite Baptist Church as CeaseFire New Orleans announced that it has fully launched its Central City operations. 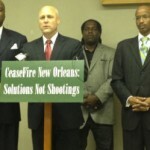 CeaseFire New Orleans is a community-based violence prevention and interruption program launched by Mayor Landrieu as a part of the City’s Office of Criminal Justice Coordination under Commissioner Carter. The program uses street level outreach and conflict mediation to reduce incidences of homicide and gun violence in strategically chosen target areas. CeaseFire New Orleans is an initiative of the City of New Orleans, operated by the Urban League of Greater New Orleans. The funding for CeaseFire New Orleans’ community mobilization and public education campaign comes from a Baptist Community Ministries Transom grant. The Chicago Project for Violence Prevention and the Malcolm Jenkins Foundation has also provided funding. Operational funds are provided by the City to Urban League of Greater New Orleans. New Orleans Saints player Malcolm Jenkins also contributed to the effort. He stated, “Not long after being drafted to the New Orleans Saints, I had the pleasure to work with the organizers of CeaseFire under the previous name of Solutions not Shootings. At the September 2011 Saving Our Sons Crime Action Summit, Mayor Landrieu made a commitment to pursue and fund the CeaseFire model at a level of $250,000. This commitment contributed to the implementation of a CeaseFire program in Central City that community members and institutions have worked to get off of the ground since 2010. 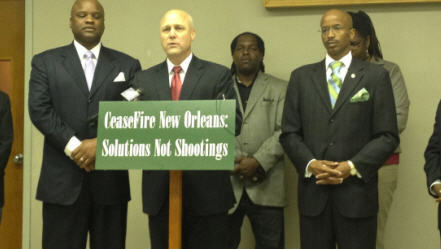 In January 2012, Mayor Landrieu committed an additional $500,000 to expand implementation of Ceasefire New Orleans into an additional neighborhood – St.Roch.